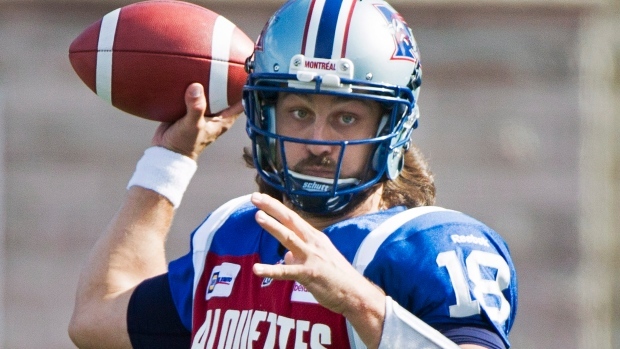 MONTREAL - Jonathan Crompton doesn't have the rocket arm or the calm demeanour of Anthony Calvillo, but so far, he wins just like the former Montreal Alouettes quarterback great. On a Monday afternoon that featured the retirement of Calvillo's No. 13 jersey, Crompton threw three touchdown passes as the Alouettes drubbed the Saskatchewan Roughriders 40-9 for their third win in a row. Crompton, who is 5-1 since he took over as the starter from Troy Smith and Alex Brink, completed only 12 of 25 passes, put picked up 225 yards with a pair of touchdown tosses to Duran Carter and another to Brandon London. "Jonathan continues to do what we ask him to do, which is lead the team and get wins," said coach Tom Higgins. "His record speaks for itself right now. "The only way to evaluate a quarterback is if you win with him. Jonathan's a winner and that's the reason we're on this roll." Third string quarterback Tanner Marsh also scored on a one-yard plunge for Montreal (6-8). Sean Whyte added four field goals. The Alouettes were a mess early in the season as they searched for a replacement for Calvillo, their starter since 2000 who retired in January. The Roughriders (9-6), who could have clinched a playoff spot with a win, have been in the same situation since starter Darian Durant's season ended with right elbow surgery last month. Neither Tino Sunseri nor Seth Doege has stepped up to claim the job. Sunseri started and went 7 for 12 for 72 yards, with a TD toss to Anthony Allen, an interception and a fumble. Doege took over in the fourth quarter and was 3 for 6 for 37 yards and an interception. "We've got to find answers to everything," said Riders coach Corey Chamblin. "It has to be more than the quarterback situation. "We have young guys in there and we depend on them to step up, but we understand that Darian's not playing and we're not hiding our heads in the sand on that. We've just got to make sure that with the new quarterbacks, we're still able to win." The Roughriders have lost three in a row and four of their last five, but Chamblin said it's no time to panic. They lost in Montreal late in the 2013 campaign and looked to be coming unglued, but then rallied and won the Grey Cup. "I remember post game saying I don't have the answers but we'll find them, and at the season's end, we found the answers," added Chamblin. "It's the same. We have to find the answers collectively about how to win football games." Allen gained 105 yards on the ground in the first half and didn't gain another yard on two second-half carries. It was fitting that all the post game talk was about quarterbacks on a day dedicated to the CFL's all-time passing leader. The intermission was extended for a 25-minute halftime ceremony in which a banner with Calvillo's name and number was mounted on the stadium wall. "The Alouettes have always done things right," said Calvillo, who got a standing ovation from the season-high crowd of 23,069. "I was so nervous to get off the field. "As an athlete, I hated when things like this go on. I just wanted people off the field so we could play. That's what I was trying to do. Enjoy the moment, get off the stage and let these guys get back to work." Higgins let his team out five minutes early to catch the end of the ceremony. Then they blew open a game they led 21-7 at half time. Chris Rainey ran the kickoff to the Saskatchewan 43 and Crompton hit Carter with a 25-yard TD pass. After a Whyte field goal, Allen fumbled on an exchange with Sunseri and Winston Venable recovered on the 30, from which Crompton hit London in the end zone. Montreal gave up only a safety in the second half. "There is emotion you can tap into and we did that," said Higgins. "We didn't want to be too high. "That would be terrible because all of a sudden you're trying too hard. But there was a plan. We had our own five minute warning and we got our players out. I think they appreciated it, and it was special for Anthony to see his (former) teammates out on the field." Montreal joined Toronto and Hamilton atop the East Division with six wins, setting up a three-way battle for what will likely be two playoff spots open for East Division teams. The Alouettes play at Toronto on Saturday, then end the season with games against Ottawa, Toronto and Hamilton. "All three teams control their destiny," said Higgins. "We all play each other. "It's who is going to line up and finish the season on a positive note. One will get the (first round) bye, one will be second and the third one might not make it." The Roughriders controlled the ball early as Allen ran the ball repeatedly, but it took an Alouettes turnover to set up the first score as Tristan Jackson recovered Carter's fumble at the Montreal 35. Five plays later, Sunseri hit Allen with an 11-yard TD pass. Montreal tied it after Sunseri fumbled and John Bowman recovered on the Saskatchewan 25. A pass interference call against Terrell Maze put the ball on the one, and Marsh ran it in at 5:02 of the second quarter. Five minutes later, Crompton hit Carter with a pass over the middle and the slotback ran it 61 yards for a TD. It was Carter's 100th career catch. After Montreal conceded a safety in the fourth, Doege handed Geoff Tisdale his second interception of the day. QB Kerry Joseph, 41, who signed with the Riders this week, was used on one short yardage play. Brink mopped up for Montreal. Notes: The 13-yard line at each end was highlighted in red, white and blue with a number 13 on the field to honour Calvillo's jersey retirement. . . The Riders were without all-star guard Brendon LaBatte, who has an upper body injury.